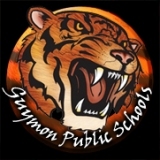 “Guymon Public Schools will suspend school till further notice. Breakfast and lunch will be served starting on Tuesday April 3. Buses will also run to deliver kids to the cafeterias for the students that live in city limits.